Here are six of our favorite eco-friendly alternatives to traditional plastic packaging. Traditional plastic bags are anything but durable, and often lead to spills. These Soft Loop Handle Take-Out Food Bags make a great alternative to plastic bags. The wide bottoms with cardboard inserts easily accommodate food containers and prevent unnecessary messes. While its strong, high-performance plastic is made with recycled materials. With Eco-Pak White Take-Out Boxes, customers can depend on the top lock to prevent spills, as well as an interior coating that makes the containers grease-resistant. Fully recyclable and microwavable, these boxes are a worry-free staple for any food delivery operation. Molded Fiber Clamshell Take-Out Containers are fully biodegradable and compostable. They’re also durable enough to protect take-out orders at every stage of the delivery process. Use these containers to transport hot/cold food. An eco-chic alternative to plastic bags, our Versa Recycled Handle Bags are made from recycled materials. These twisted-handled shoppers can also be customized with your restaurant’s name or logo to add a branded touch. If your restaurant is 100% committed to going green, try these Bio-Plus® Earth Kraft Take-Out Boxes. They are made from 100% recycled cardboard paper and endorsed by the Green Restaurant Association. Bio-Plus® boxes are also biodegradable and chlorine-free. Plus, they can easily hold any food item, whether hot or cold, greasy or crunchy. Our Molded Biodegradable Fiber Plates are a great alternative to styrofoam lunch trays. They are made from compressed sugarcane fiber, making them fully compostable. 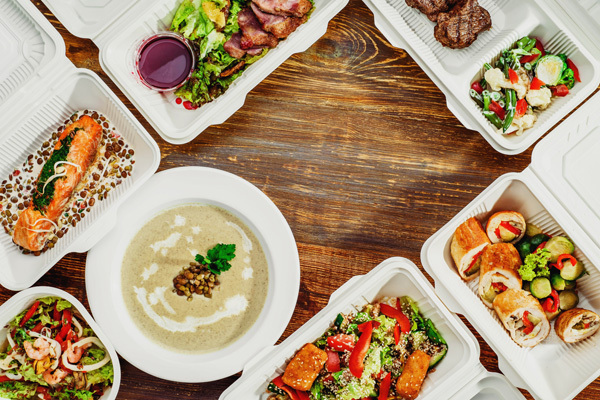 If your restaurant hasn’t already started taking steps towards a greener business model, investing in eco-friendly packaging is a great way to start. With Paper Mart’s lowest price guarantee, you can keep your overhead costs under control — and prevent waste from getting out of hand. Thank you for sharing this great alternative to plastic packaging. It’s a great help! 1. Reusable Shopping Bags. Most supermarkets offer plastic bag alternatives today. 2. Choose cardboard boxes over plastic bottles and bags. 3. Switch from disposable diapers to cloth. Thanks for sharing such beautiful info. We currently do not have any active promos. For future promotion and deals, please feel free to follow us on facebook and instagram. Thank you!